Slides are always a playground hit. Kids hoon down them, climb up them, hang underneath them and often, at some point, hurl a beloved toy down them. Even so, many playground slides can be too high and steep for tenacious tots to safely enjoy. With this in mind, Jupiduu Slides are made especially for toddlers, so little ones can slide safely – inside or out! 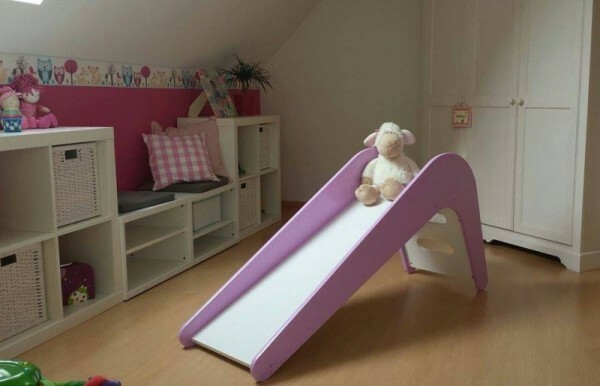 The German-made Jupiduu Slide is designer living meets play time. It has been created primarily for inside spaces, facilitating safe indoor sliding for children aged 18 months to four years. Child-friendly steps, high sides and an adorable pastel colour range make the Jupiduu a unique and stylish piece of indoor play equipment for energetic little ones. Easy to assemble, easy to clean and easy for toddlers to tackle, the wooden Jupiduu not only looks adorable, it helps tots get the exercise they need – rain, hail or shine. The Jupiduu Slide comes in various colours for $499 each and can be purchased online at My Little Giggles.